Entertainment for all age groups! Only 10% deposit required, rest is to be paid on arrival at the hotel. Free cancellation until 23:59 the day before the arrival date. if you book on this website and then find a cheaper price elsewhere offering you the same as you booked with us, contact us, tell us where this cheaper price is published and, after checking it, we will apply that price. See a better price elsewhere within 24 hours. Contact us and show us it. We will check it and apply that price. 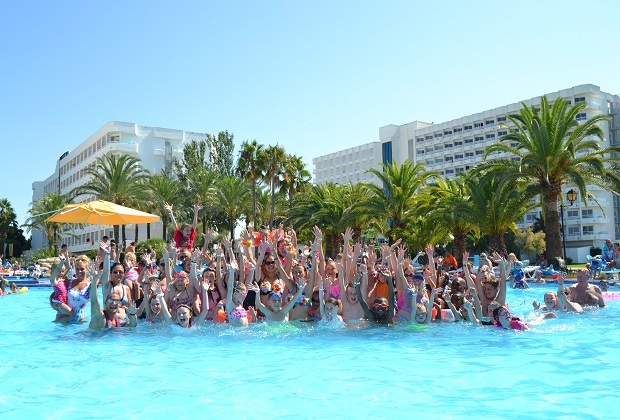 At first glance, you might think that Club MAC Alcudia is all about keeping adults and smaller children entertained. But we also have lots of varied activities on offer for all age groups. Here’s a breakdown of the kinds of entertainment older children and teenagers can enjoy. To differentiate from the youngest children, we have a category for children aged 9 to 12 – our ‘maxis’. The entertainment programme on offer for this group is specially formulated to keep them busy and make sure they all have fun. We have plenty of sports on offer. For example, the ESA Soccer Academy Stadium Experience is a must for all football lovers. A whole morning spent at the nearby Els Arcs football stadium learning all the skills. This is an example of an activity that is run along with an external body, so there are charges. For water lovers, we have regular water polo in the pool, where your children can join in team based tournaments on Thursday mornings. Waterbasket games take place every Saturday morning with Aqua Zumba on Sunday afternoons. Or perhaps taking part in a special event? We haven’t announced it yet, so be sure to check it out on 24 August! Why not let your children show their culinary skills with our Masterchef Junior competitions at the Saturno Terrace? To enrol their place go to the Guest House at the Jupiter building. It’s a pre-bookable activity so make sure you book in the day before. This is just a taste of what’s on offer – you can check our website or app for up to date listings. During our busiest season (July and August), we have a special entertainment programme just for teenagers (13 to 17 years). Group beach excursions complete with picnic, weekly discos just for teens, sports including archery and carabine shooting are all part of this itinerary. Boys and girls can also take the opportunity to find out what it’s like to be an ‘Entertainer for a Day’, take part in water polo matches in the Jupiter pool, play ‘waterbasket’ against their friends and take part in football tournaments. Along with the provision of WiFi for those who prefer online gaming, streaming movies and online entertainment, there’s something for every kind of teenager. Check our website and app for day to day programmes of entertainment and, most importantly, have fun! Airport transfers supplied by an external provider in partnership with Club Mac. You are being redirected to an external website.